This is the Sustainable Jersey Certification Report of Caldwell Boro (Essex), a Sustainable Jersey bronze certified applicant. Caldwell Boro (Essex) was certified on October 04, 2017 with 180 points. Listed below is information regarding Caldwell Boro (Essex)’s Sustainable Jersey efforts and materials associated with the applicant’s certified actions. Each approved action and supporting documentation for which Caldwell Boro (Essex) was approved for in 2017 appears below. Note: Standards for the actions below may have changed and the documentation listed may no longer satisfy requirements for that action. Additionally, points associated with actions prior to 2013 certifications may not be accurate. The Caldwell Green Team/ Environmental Commission has continued to emphasize sustainability initiatives for the past 3 years. To help us do that we have partnerships with the Grover Cleveland Middle School Ecology Club, the Environmentally Friendly Club at Caldwell University, the West Essex Ministerial Association and the Caldwell Public Library. Our annual Earth Day/ Arbor Day Contest included the topics: 2015- Design your favorite “Green Hero.” Design how the hero will help the Earth. 2016- Partners for the Planet Contest. Grab your family and friends and make green contribution to the Earth 2017 –How Plastic Is Your Life? Winners are announced at Earth Day. Fliers are included. Our initiative against plastic pollution has been ongoing with the use of the movie “Bag It.” We received an Environmental Achievement Award from ANJEC for promoting the decrease of the use of plastics in particular, the plastic bag. In 2014, Caldwell purchased a parcel of land with a building on it. It is now part of our Open Space Inventory. In 2015, the commission applied and received an open space grant from ANJEC to develop the site as a pollinator garden. We received another Open Space Grant from ANJEC in 2016 to purchase signage for the site. With the help of many volunteers, we are continuing to develop the property. Photos and documentation with be included in an Other Action. Caldwell’s Sewer plant was chosen to be part of PSEG’s Solar 4 All Program in 2014. We are currently awaiting the dedication of the site. Photos and documentation will be included in our application. We are encouraging the Council to become part of the Energy Sage Program for our residents to learn more about solar energy. We continue to review site plans from the Planning and Zoning Boards. The Borough of Caldwell participated in the NJ Clean Energy Program by upgrading the lighting facilities in 3 municipal buildings - the Caldwell Borough Hall, the Caldwell Library and the Caldwell Fire Department. The Lighting part has been completed but the HVAC has not been completed. The Caldwell Sewage Treatment plant has a solar installation under the present PSEG Solar4All Program extension. The plan includes a photovoltaic array with about 200kW of peak output and battery backup to allow for continued operation during grid outages. For additional information on this project please visit: http://www.pseg.com/family/pseandg/solar4all/extension/index.jsp Included is a summary of the Caldwell Sewage Plant electricity usage as requested. Caldwell Public Library Children’s Garden Financed with a donation for tools and garden supplies from the Kiwanis Club of Caldwell and West Essex and assistance with garden materials from the Caldwell Department of Public Works, the director of the Caldwell Public Library and a Caldwell Environmental Commission Member/Master Gardener created a children’s garden on the grounds of the CPL. The garden program which meets weekly in the spring and early summer engages students in grades kindergarten through fifth grade in horticulture education and basic gardening skills. Teens from the local 4-H garden club act as mentors and work in the garden during the summer months. The garden produces bountiful crop of vegetables and herbs which are shared among garden club members and the Caldwell Community Center’s Senior Citizens program. ANTI-IDLING We have continued our support of anti-idling. 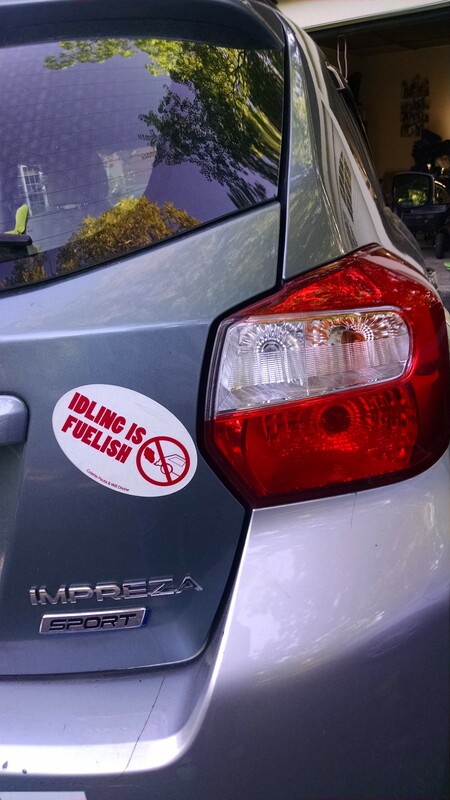 The Environmental Commission conducted a contest in January, 2015 for the Middle School Eight graders to design an anti-idling magnet. We had a local policeman come to talk with the club to encourage them to get their parents not to idle. A copy of the magnet is included. We continue to give out the magnet at our Earth Days. Anti-idling information is included when we speak to local groups. It was part of a presentation to the First Presbyterian Church of Caldwell for Earth Day this year. We have reached out to the Caldwell University Environmentally Friendly Club to encourage their students not to idle. A Caldwell University student did an independent study project on idling at the university and had a table at our Earth Day in 2016. We will continue to do this in the fall. They declined our request to put up signs. We partnered with the West Caldwell Environmental Commission to meet with the Superintendent of Schools in July to propose an anti-idling program for fall, 2017. The West Caldwell commission encouraged their council to pass an anti-idling resolution. A copy of the resolution is included here. The Superintendent of Schools, Dr. James Heinegg will be including mention of anti-idling in his back to school letter and is reviewing the schools that would need anti-idling signs. A copy of his letter is included here. We plan to encourage both police departments to enforce anti-idling. We have adapted the anti-idling presentation for use by all Environmental Commissions. Pollinator Garden Project In 2015, the Caldwell Environmental Commission applied for an Open Space ANJEC grant to develop a pollinator garden on a newly acquired open space property. We received another ANJEC grant for a sign in 2016. We developed a meadow and planted 5 pollinator trees. With the help of another grant from the Home Depot Foundation and the labor of Home Depot employees, we installed permeable pavers so that the garden is wheel chair accessible. Many groups in the community have assisted so far with this project with their labor and monetary support – Troup 6 Boy Scouts, Caldwell University students, the Rotary Club of the Caldwells, the Master Gardeners of Essex County, Shop Rite of West Caldwell, local landscapers- James Haas- Landscape Spectrum& Green Maple Landscaping. Currently, we are designing and planting the rest of the garden that will attract butterflies, bees, and birds. We showed a power- point program at the Library and Shop Rite. The result has been that Shop Rite will be developing their own pollinator garden! An adult and a children’s pollinator workshop will be given at the Caldwell Library- each participant will receive a milkweed plant to help the Monarch butterfly. In the Spring of 2016, Mayor Ann Dassing sign onto the National Wildlife Federation’s Mayor’s Monarch Pledge Program. We are creating monarch waystations throughout the community – at the library and the local schools. The Rotary Club of the Caldwells is supporting this activity. The lead in this endeavor is Commissioner Jane Kinkle. She is providing workshops on monarch butterflies and their dependence on milkweed plants. The waystations will provide a source of nectar and pollen for all insect pollinators and a unique educational opportunity for students to learn about the complex relationship between the monarchs and milkweed plants and this butterfly’s amazing migration. Currently, we are adding resources on pollinators and climate change to our library a a result of the Sustainable Jersey grant. The Caldwell Environmental Commission has been in existence since 1976. As part of our charter, the Town of Caldwell Environmental Commission was established for the protection, development or use of natural resources, including water resources, within the territorial limits of the Borough of Caldwell. Activities and accomplishments in the past calendar year include the following: * Reviewing of multiple site plans submitted to the Planning & Zoning Boards. * Continued development of the Personette Open Space Property as a pollinator garden. We received an ANJEC Open Space Grant, a Rotary donation for the purchase of a fence, and a ShopRite of West Caldwell support for the plants. The community is being made aware of our progress through a power point presentation. * Continued development of our plastics initiative through the use of "Bag It." We has showings at Caldwell University and the Caldwell Library. We received a 2016 ANJEC Environmental Achievement Award for our plastic pollution initiative. 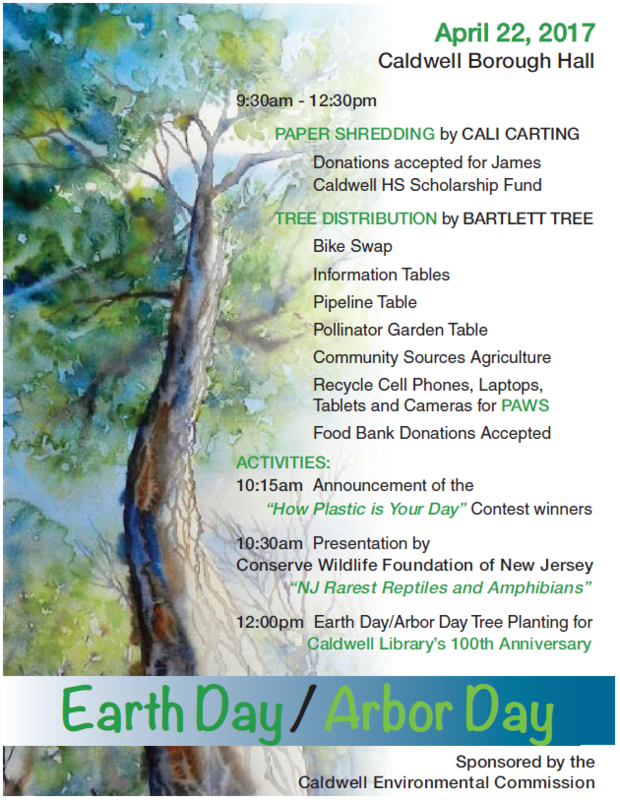 * Our annual Earth Day / Arbor Day was held on April 30, 2016. Activities included paper shredding, bike swap, tree and bag distribution as well as environmental information distribution. * We are participating in PSEG's Solar4All Program. The panels have been constructed at our Sewer Plant in West Caldwell and are delivering energy to the power grid. We are waiting for the battery back-up system to be installed. The Land Conservancy of New Jersey has completed the update for the borough of Caldwell's Natural Resource Inventory, last completed previously in 1996. The 2014 Environmental Resource Inventory Update meets the standards listed in the “What to Do” section of the Sustainable Jersey certification action, consistent with the recommendations of the Association of the New Jersey Environmental Commissions. The ERI Update was reviewed by the Borough’s Planning Board for adoption as an Element of the Master Plan at its September 10, 2014 meeting. The Land Conservancy of New Jersey completed the Borough’s 2007 Open Space and Recreation Plan and recently updated Caldwell’s Preserved and Public Lands Map and Inventory. The Environmental Commission will inform the Caldwell Borough Council on September 16, 2014 of the completion of the NRI and make the recommendation that the next update be when the Master Plan is updated. The Tree Protection Ordinance has been in effect for many years. Throughout the years, we have advertised our regulations by news articles, letters to the editor and in our comments in the site plan reviews. We emphasized the value of trees in our recent "Tree Day " and in the contest for the school children and residents of Caldwell. At the "Tree Day", we had an organic landscaper and our town tree expert available as a resource for people. Caldwell is an established community with many trees. We value our trees and have a Tree Protection Ordinance. We have been a Tree City for 19 years. We hold an Arbor Day/ Earth Day event each year . Our Arbor Day tree this year was to commemorate the 100th Anniversary of the Caldwell Library The Community Forestry Plan and Tree Cover Goal will expire on December 31, 2017.Our town forester is currently reviewing the plan in anticipation of the expiration at the end of the year. The Town of Caldwell adopted a Green Purchasing Policy by resolution on July 15, 2014, for the purpose of creating a more sustainable community throughout the borough's facilities. The resolution is the latest step in what has been an ongoing attempt to encourage greener practices. Several years ago, for a brief trial period, recycled paper was purchased for all town office printers. More recently, Caldwell borough replaced 14 personal printers and fax machines with two leased departmental copier machines, resulting in an immediate reduction of energy. As part of this recent shift, the town currently has a contract with a copier company to send back and recycle empty ink cartridges. The Environmental Commission hopes to follow up our resolution with some additional recommendations to each department to purchase more green and energy efficient products, such as EPA Energy Star appliances. We feel the resolution is a great next step in this process. The Town of Caldwell passed a Green Grounds and Maintenance Policy on July 15, 2014. We are implementing the policy through our Public Works Composting program. Specific details are outlined in the Recycled Materials and Composting Section. Municipal Composting The Caldwell Borough Council passed a Green Grounds and Maintenance Resolution on July 15, 2014. The Department of Public Works currently collects leaf waste and tree debris from our parks, town property and residents for composting—a program that has been in operation since the 1980s. They collect yard waste from the resident once per week throughout the year. The materials are taken to our property adjacent to the Caldwell sewer plant to be composted. The composting is done by North Creek LLC, a sitework contracting company that leases the site from the town. Owner James Bestys indicates that the town saves anywhere from $30,000-$35,000 annually by using this facility and service. The mulching is done through a tub grinder process with the resulting mulch blended in with fill dirt, producing hundreds of cubic yards of ground mulch. After the Caldwell Department of Public Works delivers materials to the site, it is composted and the resulting mulch is then made available for use in town greens and parks, and for free to town residents for their own use. Caldwell does not have to pay a fee for this service. To publicize this program, we distributed free mulch at the Environmental Commissions' Earth Day/Arbor Day event on May 3, 2014. The town of Essex Fells also utilizes this site. We hope to encourage other towns in the West Essex area to use it for composting. Also, after discussions with Mr. Bestys, plans are in place to arrange a seminar for students of the middle school and high school, to teach them about composting. 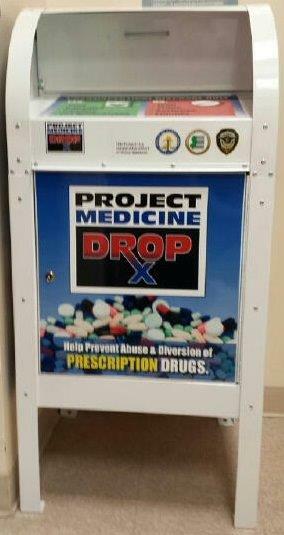 The Caldwell Police Department started the drug safety disposal program (Project Medicine Drop) in July 2013. The Town of Caldwell has added a link to their website to provide information about proper disposal of medicines. According to our Police Chief, the pounds of material collected each year have increased since the beginning of the program as indicated by the data collected. Once a month, the Police department visits our local Senior Citizen facility to collect medications. The Spring newsletter (included) has an article on the medicine box drop-off at the Police Station. Paper Shredding Day The Caldwell, New Jersey Environmental Commission held a "Paper Shredding Day" in conjunction with our Earth Day on April 22, 2017. It was widely publicized in both the Patch ,the Progress, and on the town website and TV station. Flyers were also posted in local business and it was posted on the virtual Backpack informing the families of the "Earth Day/Arbor" and the "Paper Shredding. The Environmental Commission held its Earth Day/ Arbor Day at the Caldwell Green while the paper shredding was done in the Borough Hall Parking Lot. This event was held in conjunction with the James Caldwell High School Scholarship Committee . Students from the high school manned the shredding site while members from the Environmental Commission manned the Earth Day section directing people where the shredding was taking place. Our local waste hauling, Cali Carting donated the cost of the shredding . 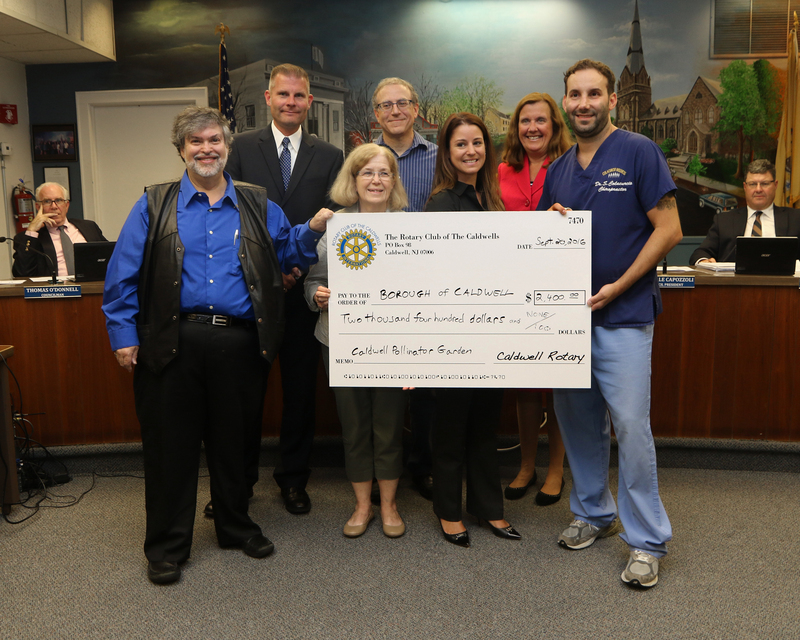 $2,767 was collected and will provide 2 scholarships for high School students. Between 100 and 125 people participated in the event. The Caldwell Environmental Commission has been actively promoting plastic pollution initiatives for over 2 years. We have reached out to the local college students at Caldwell University, our community residents by presentations at the Caldwell Library and the local West Essex Ministerial Association . As a recipient of an ANJEC Environmental Award, we were able to reach all the participants of the 2016 ANJEC Congress through our display at the Congress. We were able to distribute reusable bags there. 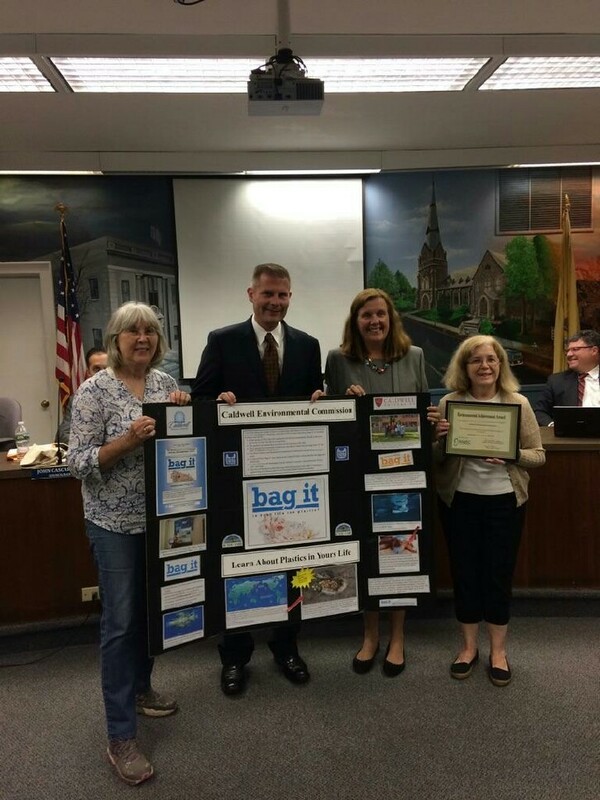 At our most recent Earth Day/ Arbor Day, we had a petition to encourage our Council to voluntary ban the plastic bag in our town. We are also developing a plan that would encourage shop owners to support the plastic bag ban.